Partial lunar eclipses, occurring when Earth blocks a portion of the sun’s light to the moon, result in a darkened part of the moon and can be seen from various locations. Full lunar eclipses, however, are infinitely more spectacular to view, as the entirety of the moon turns black. But, the most rare and beautiful of these cosmic coincidences is the blood moon. 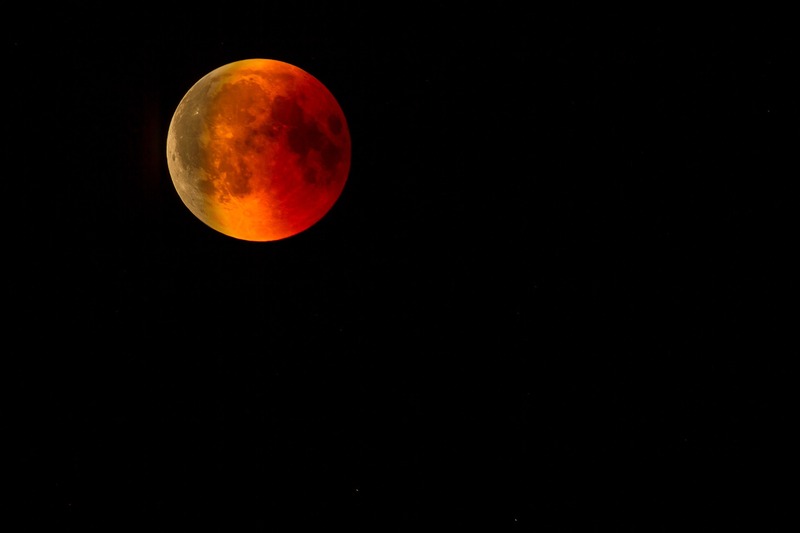 This is caused by a full eclipse where fragments of light from the earth’s sunrise and sunset stretch across the moon’s surface, giving the appearance of a blood-red moon. While this is practically common knowledge (or easily researchable) now, previous civilizations had their own explanations for this phenomenon. The following article will look at some of these ancient theories as well as a few examples of blood moon’s having an impact on historical events as a result. As you can imagine, the sudden image of a bloody moon carried bad connotations for many ancient societies. For example, the Inca people – who were most noted for establishing a pre-columbian empire centered around Peru – believed that the blood moon indicated a large jaguar attacking the moon and became fearful that earth would be next. To ward off the impending attack, they would shake their spears, scream and have their dogs howl toward the moon, which – to their credit – worked every time. The ancient mesopotamians, on the other hand, had a slightly more sane approach to the blood moon, believing that it was instead foretelling an assault on their king. Given their ability to predict lunar eclipses to a fairly decent accuracy, a pseudo-king would be for the duration of the eclipse while the real king went into hiding. Not all civilisations considered the blood moon to be an evil or malevolent presence. In fact, some believed quite the opposite. The Batammaliba people in Togo and Benin in Africa, for example, viewed the blood moon as a sign of conflict between the sun and the moon – which isn’t as far from fact as previous or even current theories – and believed that they should try to help. As a result, the duration of the blood moon is considered a time for conflict resolution. Finally, and similarly to the Incas, the Native American Hupa and Luiseno tribes from California also viewed the moon as a living thing. Instead of being specifically concerned with a jaguar however, they believed the blood moon indicated a more general wound to the moon. After the eclipse, they went about healing the moon through wives and tribesmen. The Luiseno, for example, would sing and chant healing songs towards the darkened moon.